1949 Trivia Playing Cards. 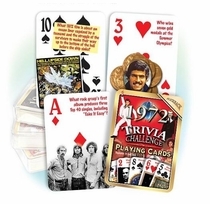 For a great 70th birthday gift, try this is standard deck of 52 playing cards. 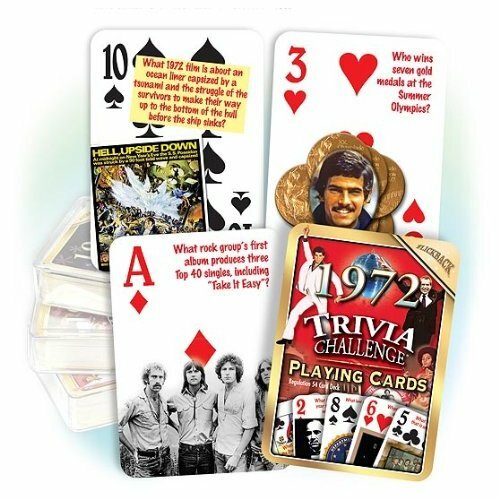 Each of the 70th birthday cards has a trivia question with a colorful image relating to that question. The answers to the questions are on a seperate key card. Look at these sample birthday cards: Who recorded "The Fat Man" considered by many to be the first true rock 'n roll record? (Fats Domino), Which Arhur Miller play, centered on the fraying fictional character Willy Loman and earned the Pulitzer Prize? (Death of a Salesman), Which Rodgers & Hammerstein musical featuring "Some Enchanted Evening" premiered? (South Pacific), What German automobile was seen in New York for the first time? (Volkswagon Beetle), What was the name of the first feature film to star Dean Martin and Jerry Lewis? (My Friend Irma), Who won the NFL Championship match between the Los Angeles Rams and the Philadelphia Eagles? (Philly 8-0). See also our other 70th birthday gift ideas.